Summary: There are five big trends that will help mold the human resources departments in law firms to innovative departments that shape the future of the law firm. A lot can be learned by looking at consumer trends. Standards are constantly changing, forcing the legal industry (and others) to keep up. The expectations from our work, how we work, where we work, and the types of technologies used in the workplace are affecting how law firms and companies are accepted as desired places to work. Not taking the necessary action to keep up with these changes will put your firm in jeopardy of extinction. All of these changes put the HR departments in an important yet difficult role to make sure the firm is set up for success. Technology has already changed the recruiting process. The usage of apps to apply to jobs and then conducting interviews by video are already new changes, but there are plenty more that will likely happen soon. Here are five trends that you are likely to see that you can take advantage of now to put your law firm ahead of the game. Custom workplace experiences for attorneys and other staff. The best law firms will provide a unique experience for each employee. This will greatly affect the decision employees make regarding how the employee works at the office, the type of engagement they need to meet their goals, and the giving and receiving of personalized feedback. HR will be required to be more involved with other aspects of the law firm such as IT, office space, and internal communications to provide this experience for employees. Agile recruiting methods will streamline the process. The ability to attract attorneys to your law firm is critical to its survival. Streamlining your software development so that it is faster and adjusts easily for changes is the first part. Adopting a Scrum method of recruitment allows for massive hiring needs to be broken down into collaborative and incremental steps with the highest-value hiring challenges addressed first. 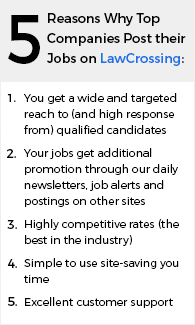 Take these needs to recruiters and you can cut the amount of time it takes to fill positions in half. Increase of employee advocacy programs. Employees can be the best brand advocates. Inviting your attorneys to take part in the promotion of the law firm through social media platforms will give your firm credibility. The reach your attorneys have through social media is larger than just your law firm. Create advocacy programs to help encourage your attorneys and other staff to be engaged in the process of recruiting new employees. Design thinking will change HR. When you are using a design thought process, you are putting yourself in someone else’s shoes to better understand their needs. By doing this for your attorneys, they will experience greater satisfaction with their job. Give your attorneys the chance to come up with ideas for tackling challenges such as talent acquisition, learning, development, and new-hire onboarding. HR strategies guided by people analytics. HR has the unfortunate task of tackling dissatisfaction and retention. In other industries those points can be tackled by mining customer data. HR used to rely on traditional experiences and personal relationships to handle those issues, but they no longer have to. Technology exists that can find the chances of retention in given positions by looking at location, employee engagement, compensation, sentiment, and manager engagement. This data will pinpoint attorney roles that may lead to at-risk employees. All of these steps will help HR professionals develop new roles inside law firms. Consider introducing a recruiting Scrum master, employee experience master, or a people analytics director position to the HR department. Ensure the law firm’s personnel are trained with new skills such as design thinking.